You have 3 nested cups and 3 balls. Place the balls in a line on the table with a cup placed behind each one, mouth down. 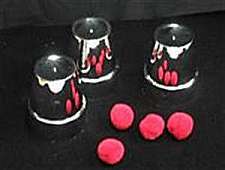 Place center ball on bottom of its cup, place left cup over this followed by right cup. When stack is lifted, the ball seems to have penetrated the bottom cup and now sits on the table! Instructions included for more tricks.